Affluent and aimless, Conrad Valmont lives a life of leisure in his parent’s prestigious Manhattan Hotel. In the span of one week, he finds himself evicted, disinherited, and… in love. For Conrad this was apparently the longest and most painful week. For me this was the longest and most painful movie experience. Anyway I have a strong dislike for a voice-over that begins with “This is …” followed by the name of the main character. This is usually already a bad omen. You can almost compare it with the voiceover that starts with “My name is …” followed by the name of the main character (with a few exceptions such as “Forrest Gump“). 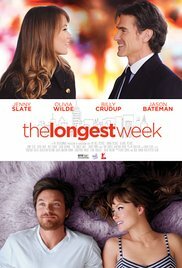 But lets return to “The Longest Week“. They’ve taken their time to release this romantic comedy (although I haven’t discovered much humor). Apparently it was already completed in 2012. Was it doubt that made them forget about it ? Or were the reactions of the test audiences so disastrous? However, if you want to see how a spoiled rich son in his thirties is thrown out of his comfort zone without money or continuous attention for his egocentric personality, after that relying on a friend to get through this horrible time and falling in love with a handsome model, then you should definitely take a look. Don’t forget to lay down a cozy cushion near you, because this is just about the slowest film I’ve ever seen with content so meaningless, that I hand over an award to myself for unparalleled endurance. Visually it all was quite beautiful to watch. Stylized, detailed and artistically (the series of images, the jazzy music, the clothing and furniture). It also had a little tendency to be pretentious. Well that suits the main character Conrad : a pretentious snob who’s being pampered all his life by the staff of The Valmont Hotel. A narcissist who has never proven anything and will never have the need to prove himself. Someone who was born so privileged that he can’t imagine what it’s like to care for himself in real life without everything being handed on a silver platter. Maybe that’s why I already hated this pretentious layabout and would-be author after 10 minutes. The fact that his future novel (in the line of Fitzgerald) wasn’t yet completed, I attribute solely to his lifestyle. That some life lessons are the cause of an acceleration in his writing process, was pure fiction, in my opinion. Read other reviews and the name Woody Allen comes up often. Despite the reputation and the huge share of followers this filmmaker has, I’ve never been a fan of his creations. They each seem like complex, highly intellectual comedies. I always had the impression that the humor of Woody Allen’s films was hidden in the syntactic errors that the main players made cunningly, because I never really thought it was funny. I know that those who link this movie with Woody Allen didn’t think of this fact particularly, but for me this is the most plausible link, because real humor I haven’t found in “The Longest Week” either. There was one particular moment for me that seemed comical. When Jenny Slate (I really have to watch “Obvious Child“) gives her opinion about a play they’ve attended, and by that lays her finger on the sensitive points. I understand the satirical meaning of this film and the exaggeration of Conrad’s pretension, but couldn’t honestly empathize with the complete story (in analogy with Slate). It’s like the descriptions used for Dylan Tate, Conrad’s best friend : Dylan is “an anti-social socialist”, “a closet conversationalist” and “a clinical neurotic”. A series of expensive, intellectual words that sound complicated, but ultimately mean nothing. Similarly, the snobbish conversations with much ado. I was always wondering which individuals would converse in such a way with each other and at the same time know what it’s about. Even the notorious love triangle they came up with, felt artificial. As artificial as the eyelashes of Beatrice (Olivia Wilde). They reminded me of the plastic doll my sisters played with 40 years ago. It had the same flashing eyes with lashes so big that you could protect yourself against the burning sun in summer. Pretentious, not?